2 by 3 Heroes: GAME ON! I work in tech support. My job is to come up with solutions to problems. Sometimes I have to come at a problem from a different angle to solve the issue. And at my job, we have a database of fixes. It stinks, cuz it's really tough to search. But before this program, we had our own collection of resolutions. You could click a link to rank the solutions, so when a tech searched for a problem, the fixes that worked the most sorted to the top. If you searched by name, a lot of my entries had scores of 2 or lower. Mainly, I had to create the solution that wasn't common, so it wasn't widely used. But that's all I really created in my life. I'm not an inventor, and I certainly haven't created anything entertaining. In fact, my only creations are my two kids and the gray hair on my wife. Do you realize what all the coloring does to it, hun? My wife, however, did create the greatest sports game ever: Squatee Ball. What? You have never played it? It's a up and coming college competition that may be in the Olympics in 2022. For those unaware of the rules, let me go over them. Ok. But how do you play it? Usually, it's with two competitors. Each has a pillow in their hands. Usually, the best pillow for this is one of those square pillows you find on a couch. For the ball, it needs to be something soft, like a balled up sock or a small Nerf ball. Then, you hit the ball back and forth between each other. Score isn't kept, really. And you can hit it multiple times if you need. Think of it as keeping a balloon afloat, except it's a sock, and you are hitting it with pillows. Oh - there is a third piece of equipment: alcohol. So when Gavin created Wallet Card, I was in. Place a card you don't mind ruining in your wallet. Take it out from time to time and snap a picture with it. Pick a card that makes you smile when you see it. I didn't completely follow the last one, but I picked a card that I won't mind seeing for 365 days. Yup. 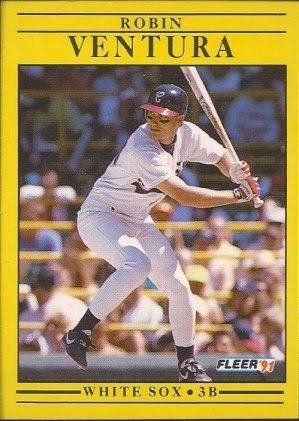 A bright yellow '91 Fleer of Robin Ventura. My wallet is brand new and black, so the contrast is pretty remarkable. I'm fortunate that the card j-u-s-t fits where I keep my debit card, so it will be getting a lot of wear and tear as I pull that out. I hope I also get some looks and comments from people if they see it. Play ball!